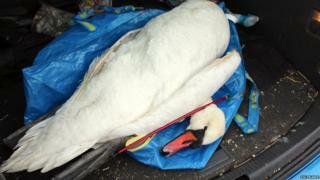 A mute swan has been killed in a crossbow attack in County Antrim. The bird was still alive with a bolt lodged in its head when it was seen at Loughshore Park on Monday night. The park, with its access to Lough Neagh, is a popular attraction in Antrim town. The Ulster Society for the Prevention of Cruelty to Animals is offering a reward of £500 for information leading to the arrest of those responsible for the "appalling attack". The adult swan had been struck between the eyes at close range, said the USPCA. It did not die immediately, but evaded rescuers' attempts to capture it, and was subsequently found dead. "It succumbed to a lingering death with unimaginable suffering," said a spokesperson for the charity, adding that the local swans were trusting of humans and often fed by park visitors. Police in Antrim have appealed for information on the incident. Sgt Neil Patton: said that shortly before 20:30 GMT on Monday "police received a report about an injured swan that had an arrow lodged in its head. Police attended the scene along with a local vet, but were unable to capture the bird. The swan was found dead by a member of the public today". The Royal Society for the Protection of Birds also condemned the attack, saying the deliberate targeting of wildlife was a crime that should be "strongly condemned". The wildlife charity advised anyone with information about similar incidents to report them to police as a wildlife crime. The use of such a serious weapon as a crossbow had lent the incident "an even more sinister edge", said Alliance Party councillor Neil Kelly. "This vile brutality towards animals should have no place in a decent society and it's difficult to comprehend the mind of someone who would willingly partake in such behaviour," he added. Cllr Jim Montgomery of the Ulster Unionist Party said it was" impossible to understand the mentality of an individual whose mind is so warped as to commit such a sickening attack and take some form of pleasure in inflicting suffering on a defenceless creature". Mr Montgomery said it was extremely important the person responsible was caught and brought before the courts.